On August 13, 2017, Princess Caroline came together once more with her family for family holiday. 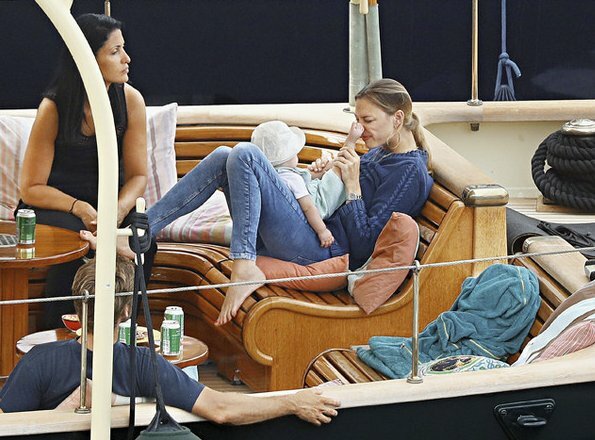 Princess Caroline of Hanover, Pierre Casiraghi, Beatrice Borromeo and Stefano Ercole Carlo Casiraghi are seen on the Pacha III yacht in the French Riviera. Je suis déçue,Pierre n'a pas les abdominaux de Ken ! Except for the colouring, of course, I find that Caroline resembles Grace more and more in profile. Off the topic slightly but for years I've wondered about the relationship between Caroline and Stephanie and also the relationship between the cousins. I have been a long time follower of Caroline and I'm yet to see her or her children interact with Stephanie and her children outside of royal duties. Never ever do you see them dining,shopping,holidays etc or just hanging out. Can anyone help here?? Sorry to be off fashion here!! I would like to know that too. Does Princess Caroline do royal duties still. Caroline still does duties - she is basically still in charge of all the aspects of cultural life in the Principality and has been at various events recently. She also is very active with the AMADE children's charity. There is no problem with her relationship with her sister - they don't have much in common in terms of their interests but they get on fine - there are photos that show them quite happily in each other's company. The cousins also get on well - Camille and Alexandra seem quite close. Camille attended Alexandra's 18th and they follow each other on social media. Louis gets on well with Pierre and Andrea and is often seen with them at sports fixtures. living, and I mean Charlotte, Andrea,their couzins??? Stephanie and Caroline get on fine - have to say I haven't noticed this tension at all. There was a period in the past where they didn't see much of each other - Caroline was in Paris and both were concentrating on their families and interests but there was no falling out. (Stephanie mentioned this in an interview at the time). They don't actually have to do anything for a living but Andrea and Pierre are active in their father's businesses, Pierre sails, Andrea also does charity work, Charlotte represents Gucci and Mont Blanc, dabbles in a bit of writing, riding, promoting the Philosophy events and apparently has a production company. Louis works I think for AS Monaco, Pauline is taking her first steps in fashion design. The only ones I'm not sure of are Camille and Alexandra although I read that Camille is a gifted photographer and would like to act.